What happened to John’s comedy mustache? The teaser for Sherlock, series 3, introduced us to John Watson’s comedy mustache, but the BBC has released the first still from the upcoming season and the comedy mustache is nowhere to be seen. What happened to it? Why was it shaved? WHY WAS IT GROWN? Forget blackmailers and missing persons—the real mystery is that of John’s comedy mustache. Everyone is comparing this still to Edward Hopper’s Nighthawks, because it’s in a diner, I guess, but there is a Hopper-like loneliness to it. Mundane spaces and everyman angst—that’s Hopper all over. (If you want an office designed to make people vaguely uncomfortable, hang Edvard Munch’s The Scream, Hopper’s Gas 1940, and anything Edward Gorey and watch your nemeses slowly unravel in an atmosphere of latent paranoia and crushing existential angst.) Like the teaser, there’s no context for this image. Is it before Sherlock returns? Or after? 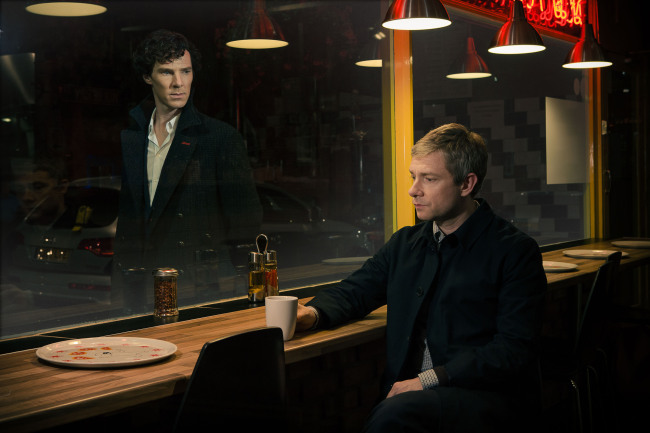 Could be either—John is sad: before; Sherlock is sad; after. It does dovetail with the teaser, though, and makes it look like The Reunion happens in a restaurant. That’s the strongest maybe, right? That the reunion happens in a restaurant. Maybe. 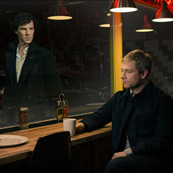 The only thing we know for sure about Sherlock, series 3, is that it premieres in the US on January 19, 2014. The UK premiere date hasn’t been announced yet, so it seems like they’re placating US fans by making us think that we won’t have to pirate it after all, but I bet the UK gets it first, even if only by a few days. For some reason, they seem entirely resistant to simultaneous broadcasts. Until then, we have twenty-six seconds and one still image to study and dissect. T-minus 74 days until the mystery of John’s comedy mustache is solved.